This chapter addresses students’ preference for screencast assessment over traditional paper or digital text-based comments. Screencast assessment allows for asynchronous audio and visual commenting on student papers using screencast software. A pilot study using a qualitative approach has indicated that students prefer screencast assessment because of its multimodality and its ability to make the instructor’s thought process while grading transparent. Multimodality involves multisensory and multimedia approaches, which can broaden student understanding of teacher feedback. The screencast, because of its multimodality, enhances students’ understanding of the instructor’s thought process and reasoning. Because of the suggestion that students prefer this sort of feedback, the pilot study warrants a larger scale project in order to investigate the student preference for this feedback and whether the method leads to improvement in student performance. 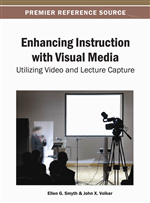 The objective of this chapter is to discuss one instructor’s experience in piloting the use of screencasting to evaluate student papers, what will be referred to as screencast assessment. Screencast assessment allows for asynchronous audio and visual commenting on student papers using screencast software. Screencasting, a video form of screen capturing, records what is happening on the user’s screen and includes the option of adding audio. With screencast assessment, an instructor can provide students with video captures of their papers being assessed so that students can see their papers from the vantage point of the instructor’s monitor; with this view, students also can see the instructor’s cursor movements, scrolling, visits to any other page or websites outside the students’ texts, and either pre-created or on-the-fly annotations—essentially anything occurring on the instructor’s screen. At the same time, students can hear the instructor’s voice commenting on their writing.1 Because of the auditory and visual combination, a five-minute screencast allows more commentary than could reasonably be written on a student paper, whether by hand or electronically. Furthermore, in-depth explanations are augmented by the instructor’s tone of voice, something impossible to provide to students with written comments alone. This form of feedback improves upon traditional feedback by using aural and visual modalities, offering a multisensory approach unlike common methods of assessing student writing, which usually consist of handwritten comments (often editing marks with a narrative at the end); the Track Changes or Comments function in Microsoft Word; or a typed, memo-style narrative separate from the document. Although effective feedback can be demonstrated in written and digital comments, screencast assessment improves upon other forms of feedback by involving a wider variety of the student’s senses. Text-based feedback, whether digital or paper-based offers a more limited form of feedback than screencast/video of assessment, yet despite the availability of digital feedback methods, instructors often choose text-based assessment techniques. Digital assessment is increasingly commonplace, and video is frequently used in social media and in the classroom, and often social media is used for learning. A number of today’s college students were born “digital natives,” and even for those who were not born into the digital world, many have adopted thoroughly mediated lives, with the Internet central to our lives and our daily routines. We conceptualize information as existing in a space of “open distribution and collaboration” (DeVoss & Porter, 2006, p. 182).2 Students are accustomed to file sharing for classroom and personal use, and to video sharing sites like YouTube for instruction and entertainment, as well as to working collaboratively online, whether via email, Google-docs®, or other sharing platforms. Therefore, the implication is that screencast assessment fits into students’ daily experiences with technology, uses familiar interfaces, and can provide more effective feedback to students about their writing than can text-based feedback alone. In turn, the method could help students improve their writing. Classroom instructors and students alike express frustration with the grading of papers, and for different reasons. Instructors typically bemoan the time consuming nature of grading and their inability to provide adequate feedback that will matter—that is, that will improve writing. Students often complain that it takes too long to get their work back, and when they do, they have too little information provided by the instructor to help them improve writing, or, worse yet, cannot read or understand handwritten comments. Furthermore, in an age in which multiple methods for digital assessment exist (including use of the aforementioned Track Changes and/or the Comment function in Word, as well as the use of audio feedback using voice recording, or even pre-packaged assessment software), most of those methods still offer updated forms of existing paper-based technology, but do not offer a multi-sensory—nor a multimodal—approach. The literature on the use of screencasting in the classroom is sparse, such that research from a variety of disciplines proves beneficial for this study; in particular, literature from three main areas frame the background for this study: multimodality in writing assessment and transparency in teaching, and effective instructor feedback.